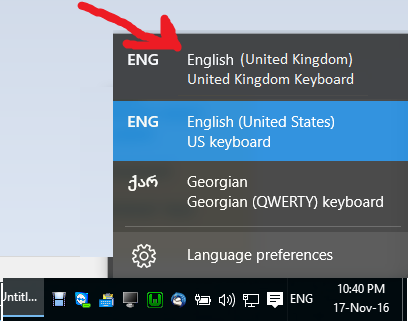 I've set keyboard languages ENGLISH-US (not United Kingdom!) and KA (my local language). Sometimes i see that ENGLISH-UNITED KINGDOM keyboard layout is added automatically in my keyboards list. However, in Control Panel, It is not listed!! It has become very annoying already... How avoid it from adding automatically? any official fix? I'm not sure what you've already tried but here are some possible solution that might help you out. You will see an option to override default input method. You can set this to your wanted keyboard setting. If you click on Change language bar hot keys (see image bottom) you can change the ALT+SHIFT or CTRL+SHIFT hotkeys. A button in the Advanced tab will say Change key sequence. You can put them on non assigned. Now change everything to the way you want it to be. "Welcome screen and system accounts"
Now all is left is to hope for the best because I don't remember if that's the right solution for the right problem. When windows was installed, what was the default language? Images normally have major languages included with them but additional languages need to be downloaded from windows update. Its probably just going back to the Image default language when this happens. It seems to be one of three issues (see the site for more details): 1) Uncheck "Let me set a different input method for each app window." in language settings, 2) Make sure your region is set to your preference, 3) In Privacy settings, turn your location off. To use this, save it in a text file and change the extension from .txt to .reg. Then whenever it comes back, you can just double click it and restart or sign out. p.s. this has 90% solved my problem, but to say true, there was a case again, when United Kingdom was added again:) but then I've quickly removed. Open PowerShell as an administrator & type these commands. After that, you can add your local language later. An application is likely programmatically adding this. Do you use anything like HP iLO or Dell's DRAC? I wrote an app that used LoadKeyboardLayout to add a keyboard layout and the same symptoms appeared (it wasn't in Control Panel but it was in the language switcher). I've noticed HP iLO plays with keyboard layouts too so that the layout reflects whatever the server is set to. Not the answer you're looking for? Browse other questions tagged windows-10 keyboard keyboard-layout language or ask your own question. 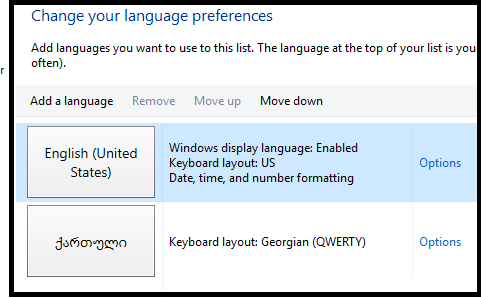 Why does 'US keyboard' keep adding itself to keyboard layout list?